Gameweek 24 is weird in that some teams, like Liverpool, had a full week of rest while others, like Chelsea and Tottenham, were forced to play in two Cup matches. The good news is that you probably don't want to captain anyone from Chelsea or Tottenham since Eden Hazard has fallen off the map and Spurs are dealing with multiple injuries and absences. Instead, most fantasy players will turn to Arsenal (v. Cardiff), Man United (v. Burnley) and Liverpool (v. Leicester) for the armband. 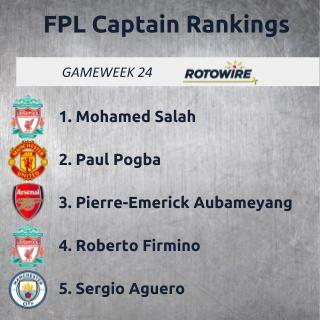 The favorite is undoubtedly Mohamed Salah, who has hit double-digit fantasy points in five of his last six starts. No one has come close to those numbers, and there's no reason to think Leicester can stop him. For starters, Leicester have been a mess, losing their last three in all competitions, including a 2-1 loss at Newport County in the FA Cup and allowing four goals most recently to Wolverhampton. With more than a week of rest, Salah and company should thrive in this spot. If you don't have Salah, Roberto Firmino is another reasonable choice, albeit less consistent with only two goals in the last three matches. You could bank on a clean sheet, but scoring is one thing the Foxes have been able to do in their losses. The next biggest home favorite is Manchester United, who should continue their romp on lower-end sides. The bad thing for Burnley is that they were at Man City on Saturday and now have this match. While they're playing well, it's hard to bet against Paul Pogba, who has five goals and four assists in his last six league starts. He only converted a penalty last match but still managed seven total shots. He's the safest of the Red Devils, with Marcus Rashford dealing with fatigue and injury issues while Anthony Martial isn't producing nearly as much as the other two. Similar to Martial, Pierre-Emerick Aubameyang isn't producing as much as he should, with only three shots on goal in his last four starts. Some of that has to do with competition, but Arsenal were shut out at West Ham, and his goal in the 4-1 win against Fulham came late. Still, Aubameyang is the type of player who can bag a brace whenever things are going right for his team and that should happen against Cardiff, who are coming off a 3-0 loss at Newcastle. I'm choosing to ignore Alexandre Lacazette even though he's been better in the last three matches with two goals on 10 shots. Aubameyang has more upside and is more likely to play a full 90. You could also throw a defender into the mix since Cardiff haven't scored in their last four matches in all competitions, but backing the Arsenal back line takes some guts, especially since Sokratis Papastathopoulos is probably the best option. While those three teams are big favorites at home, Man City are still the biggest for the gameweek. It's somewhat hard to trust on the surface, but Man City are cruising and Newcastle have allowed two goals to every good club they've faced. The question is which player to captain after Sergio Aguero assisted but didn't have a shot on goal in the 3-0 win at Huddersfield. I was sold on him becoming the top option again, but that doesn't appear to be happening. Instead, Leroy Sane has two goals and two assists in his last three league starts. The issue with Sane is that he isn't playing a full 90, whereas Raheem Sterling and Kevin De Bruyne are, though they don't have the same production. Personally, I'd pass on this situation, but don't be surprised if De Bruyne comes out of this match as the top fantasy play. Chelsea and Tottenham are next in terms of odds to win, but I can't give my armband to anyone on their teams. Christian Eriksen could be the best option at home against Watford, but he's not getting nearly as many looks on net as last season when he finished with 11 goals. That could change with Dele Alli now injured, but that's an unknown and it doesn't help that Spurs have lost their last two at home in league play. It may be worth it to keep an eye on Son Heung-Min if he returns since South Korea dropped out of the Asian Cup on Friday. An interesting differential could be Aleksandar Mitrovic, who scored one of his two away goals at Brighton earlier in the season. That's still mostly wishful thinking for a forward who has just one goal in his last 10 league starts. Fulham aren't enticing, but they're better at home and Brighton have conceded multiple goals in three of their last four road matches. The other option would be to go with Wolves and hope they can bag four goals again. Diogo Jota has turned into fantasy excellence, coming off a hat trick that has given him five goals and an assist in his last five starts. Raul Jimenez is the safer play if you really like Wolves, but it can't be forgotten that this team lost 2-0 at home to Crystal Palace only a few weeks ago. West Ham just lost at Bournemouth, but Wolverhampton have been more unpredictable than most in the Premier League. Everton play maybe the worst team in the league, but they're another side that has mostly disappointed from a fantasy aspect. Gylfi Sigurdsson finally scored last match, though he didn't create any chances, while Richarlison busted and didn't have a shot in the loss to Southampton.